Construction at the Gerald Desmond Bridge continues on Sept. 17, 2018. Photo by Brian Addison. 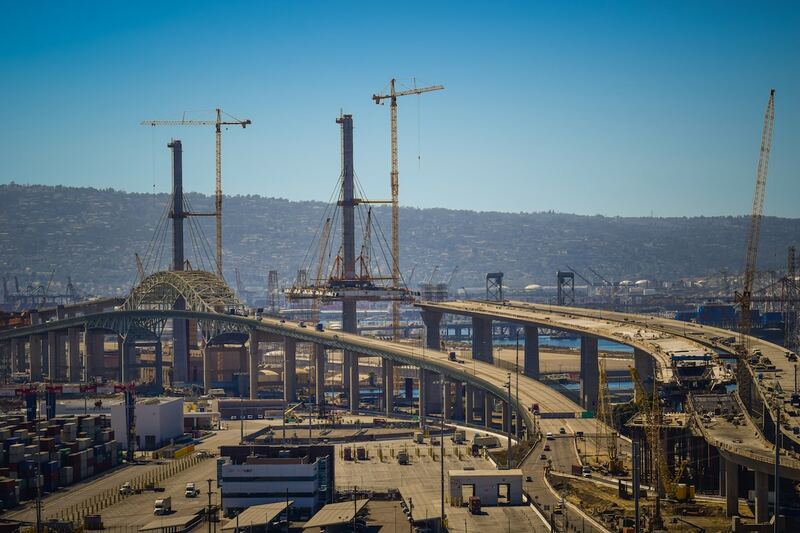 The new Gerald Desmond Bridge is one of the largest infrastructure projects currently happening in California: With a $1.2 billion price tag, the main hope is for the bridge to be mutually beneficial for trade and commuters. With two 50-story towers, the bridge will be one of the tallest cable-stayed bridges in the country while being the first of its kind in the state. The six-lane bridge—three in each direction—will welcome the world’s largest ships, given the 155- to 205-foot increase in clearance above the channel, will now have access to the port’s inner harbor. And with three lanes in each direction plus inner and outer safety lanes, it will be wider and better able to serve future traffic volumes. Other features of the new bridge include a bike path, pedestrian path and scenic observation decks. A rendering of what the new Gerald Desmond Bridge will look like upon completion. Courtesy of Port of Long Beach. Advocates are enthused about the bike lanes, especially after they fixed the major gap between the bridge and DTLB for bicyclists. But the ultimate infrastructural concern is how to further the connection west and allow full bike rides between San Pedro and Long Beach—and that means somehow creating a bike lane on the terrifying Vincent Thomas Bridge and that means the participation of the Port of Los Angeles. In an effort to keep the public updated on the project, the Port of Long Beach—which is helping fund the project along with county, state, and federal funds—has installed two live cameras. One, perched on the World Trade Center facing west, offers a glimpse at not just the construction of the bridge, but a live view of the Pier T area as a whole. The second, angled from Pier A, shows a direct view of the bridge. Additionally, POLB has also created a mobile app in the hope that bridge enthusiasts and local residents will stay connected with the bridge as it is being constructed. Not only does it provide users with access to the aforementioned live cameras, news updates, and photos, it also gives traffic updates/detours as construction progresses. To download the app, search “LB Bridge” in the App Store, Google Play, or Windows phone; or click here.